Vintage gliding is something that is growing on me (part of the aging process I guess). I have no desire (and certainly not the skills) to spend 300 hours rebuilding a port wing aileron-deflector-box-spar-spiggot in carefully selected Western Canadian Elm. 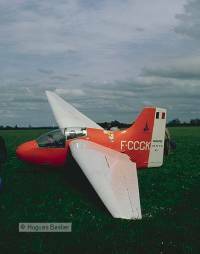 Equally those early gliders where not Sifow compliant either, each design was out to push the glider performance barrier to the limit! Also I don't have a beard. On the other hand what other branch of any aviation sport can offer such varied and fun flying with an amazing array of gliders available for next to nothing? The Vintage Glider Club (VGC) is a great place to start from (and is where I have borrowed some of these pictures from). Using my in-depth knowledge of vintage gliders, I have classified them into useful catagories, just to be helpful. 1. "Really old stuff that requires a degree in woodwork and varnishing." This example of "it only took 5 years to varnish the fuselage" is a Kirby Kite, and you have to admit it looks fantastic. No idea how it performs or what it's wing span is, but frankly who cares? This is real vintage stuff, and gets the Sifow seal of approval because who would dare criticize? Other examples include the Minimoa and Govier. 2. "Weird stuff that they don't make any more because, well just because"
The stunningly different Fauvel AV22. French. Major benefits include not being able to forget to attach the tail plane. I like the 'wow' factor. No idea how the instructor gets in or out? I presume s/he is added and removed as part of the rigging and de-rigging process. If the Genesis team announce that they are bringing out a two seater, remember that you read about it here first! Other weird stuff includes the 'Cumulus', which I am not convinced is that old at all. There is a great web site all about the Fauvel here. 3. "Stuff that makes Paraglider pilots laugh". Now Sifow is all about not hankering after excess performance, but this is extreme. Where do you put your LNav for a start? This is a 'Primary' glider, 8:1 best glide..I just have to know what the longest XC in (on?) one of these is? Wind in the hair! And this dates back to an era when wanna-be pilots would happily spend the first 2 years digging their own hanger foundations just for the promise of a few hops. Aye, those were the days. Other gliders in this category include the Magic 1 and Atlas....oh no, they were hang gliders! 4. "well it seemed a good idea to buy a tenth share in one at the time" stuff. Open cockpit, two seats, ah the joy of a T31. This is not quite category 1 stuff but still gives you the fun of 'Cat 3' without the risk of piles. 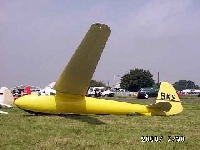 Most clubs have a glider like this owned by at least 10 pilots (required for rigging) and flown only if it was left rigged from the previous day. Actually I think a two seater, open cockpit glider is the ultimate form of gliding, so long as you can keep it rigged and don't land out. Respect to the T31 (and T21 where you get to talk to your co-pilot and stand a chance of being heard). 5. "Affordable Vintage stuff for the full VGC treatment but without the varnish"
Grunau Baby...I think this could be the one for me! This really IS a Sifow glider. I am reliably informed that as a rule of thumb "if you can see it over the nose, it is out of gliding range". I like the idea of the bright colours rather than traditional vintage 'wood and dope' finish. Not sure how many Babys are left flying? 6. "Vintage because 'old stuff' doesn't quite have the same caché." Where do you start, as soon as a wooden glider (or even first gen glass) starts to become unfashionable, it gets reborn as 'vintage'. This yellow example is an Oly 2b. The good news is that this category of gliders are spectacularly cheap and give you automatic passage into Sifowdom. K6's are currently on the boarder of 'Cat 6', so start growing your beard now . Don't buy your other half a new car, buy a one year old one and blow the savings on one of these...all those VGC parties and no need for goggles or Canadian Elm and dope! they built of things that lived and grew, like spruce and birch and casein glue. As any decent fellow should, the unpretentiousness of wood.